The Quentin Hotel i Amsterdam, Nederland: Bestill nå! Charge. 50% of the payment should be transferred 1 month before arrival as a deposit, 1-5 rooms can be cancelled 2 weeks before arrival without a charge. Amount should be paid 2 months before arrival; the rest should be paid 1 month before arrival. 6-10 rooms can be cancelled until 1 month before arrival, 1-5 rooms until 2 weeks before arrival. The hotel is housed in an authentic 17th century historic canal house which overlooks one of Amsterdam’s grand canals, so from most rooms you will have a lovely canal view. The rooms are well equipped with modern facilities to make sure your stay is as comfortable as possible. 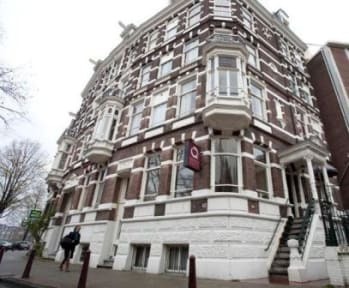 The hotel is located at the Leidsesquare (Leidseplein), near to all Amsterdam’s highlights such as the Rijksmuseum, Van Gogh museum, Flower Market, shops, bars, clubs and restaurants. The Leidsekade is a quiet street, so you will be in the city centre of Amsterdam but still have a good night sleep. 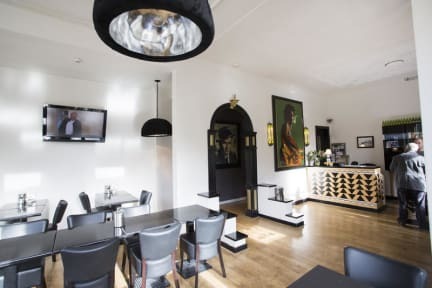 The hotel offers many services and facilities such as a private garden with terrace, free wireless internet throughout the building, an elevator, tickets to various museums and activities, a continental breakfast and free city maps.